Sauté onion in olive oil until translucent. Add Italian black coco beans, native corn, and raw pumpkin. Cover with vegetable stock and simmer until all ingredients are tender and the stock has reduced, about 35 to 40 minutes. Add trimmed snap beans and gently stir in sage leaves, sweet butter, and sea salt and pepper to taste. 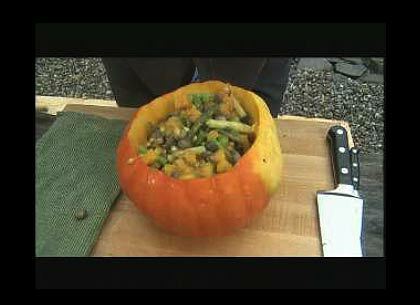 Serve in hollowed-out pumpkin shell. Chef Michel Nischan notes: If freshly picked shell beans are not available, pre-cook dried beans until just tender and add to the succotash the same time as the snap beans. If native corn is not available, use fresh sweet corn and add the same time as the snap beans. This segment appears in show #3201.